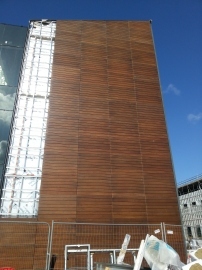 Bennetts Timber is providing exterior timber cladding panels for the prestigious new Kent Institute of Medicine and Surgery (KIMS) at Newnham Court adjacent to Junction 7 of the M20 near Maidstone. This is a new hospital campus which will eventually comprise of eight buildings which are 3 or 4 storey high with facades of timber panel, terrocotta tile and some curtain wall. The first phase is currently under construction and is due to be completed in January 2014. The timber cladding panels are designed to be hung onto the exterior of each building and are individually made up at our manufacturing facility in Grimsby. The detailed design has evolved over many months in close consultation with the building sub-contractors for the scheme, Astins, the main contractors Vinci and the project architects. Each panel comprises sustainable FSC certified Siberian Larch which goes through a process of fire treatment and staining before being cut to size and then fixed to a frame of timber battens together with a rainshield gauze. In all approximately 1,500 panels will be manufactured and around 1,000 have been completed so far and delivered to site. This shows the quality of cladding and panels that we are able to manufacture, please do not hesitate to contact Edward or Julie on 01472 350151 if you would like further information on this or our wide range of cladding products available. Further updates will be posted as KIMS progresses.